Disclosure: I was provided a copy to the book and a sneak peek at the opening scene of the movie in exchange for my honest review. All thoughts and opinions are my own. Do you ever wonder what happens after you die? Do you think about heaven or hell? What if you could hear about one person's experience in heaven...would you want to hear it? Well Don Piper has this story for each of us. I was able to read the new version (the movie version) of his book 90 Minutes in Heaven. I found that it wasn't the fast and easy read I thought it would be. There's a lot about Don's life before and after his time in heaven. Don was killed in a car crash in 1989 and went to heaven for 90 minutes. When the prayers of another pastor brought him back to life on earth, he had a long recovery and is still coping with being in heaven, then back on earth. While none of us really wants to die, once we are in heaven with all the glory of the Lord and Jesus himself--who wants to come back? In this highly introspective and thought-provoking book, we look at Don Pipers life before and after being in heaven. We also get to glimpse what he saw from the outer gates of heaven while he was there. It is hard to read at times and difficult to absorb all that is going on. That doesn't make it a bad read, but it did slow me down because I was being more introspective myself. 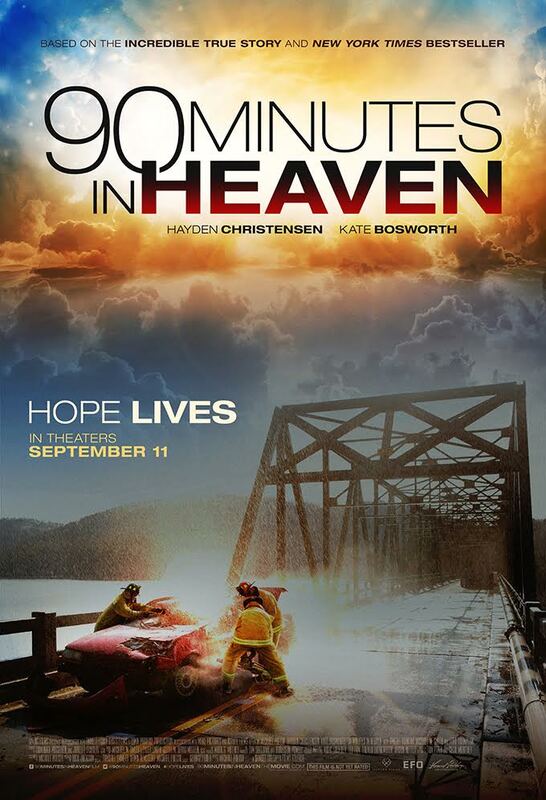 The 90 Minutes in Heaven movie releases in theaters next Friday, September 11. I got to watch the opening scene and it looks like it's going to be an awesome movie. The opening sequences held my attention and left me wanting more. I can't wait to see it. Check here to find theaters near you. I'm so excited that I get to give away a copy of the book 90 Minutes in Heaven to one lucky reader. Please enter using the Giveaway Tools form below and good luck!